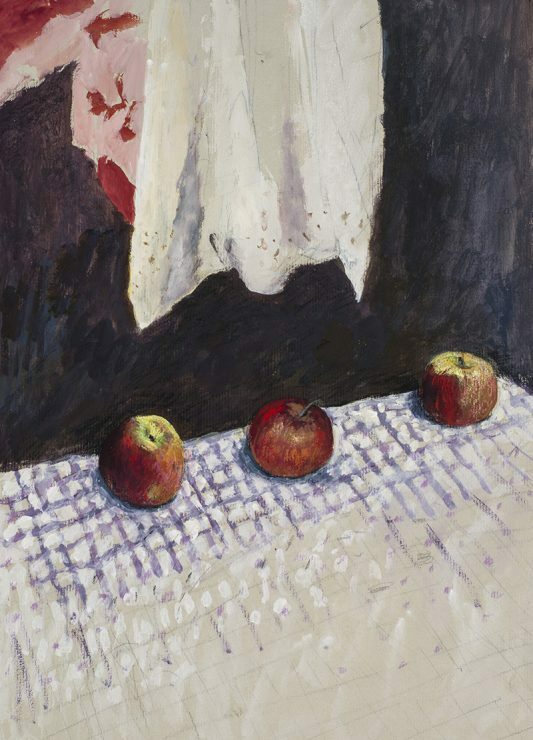 William Robinson, Apples on a table, (detail), 1971, gouache on paper. Private collection, Brisbane. 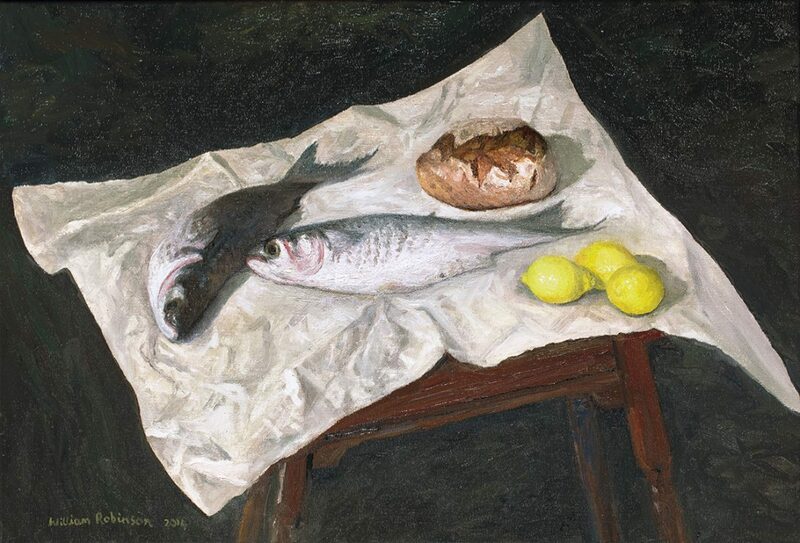 William Robinson, Still life with stunned mullet, 2014, oil on linen. QUT Art Collection. Purchased through the William Robinson Art Collection Fund, 2016. William Robinson, Interior with black dog, 1970, oil on linen. QUT Art Collection. 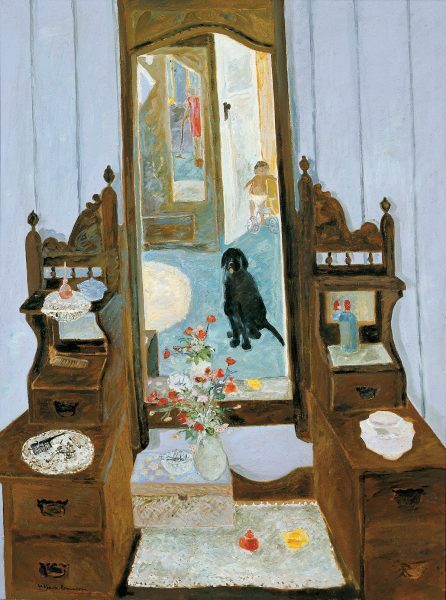 Purchased through the William Robinson Art Collection Fund, 2013. 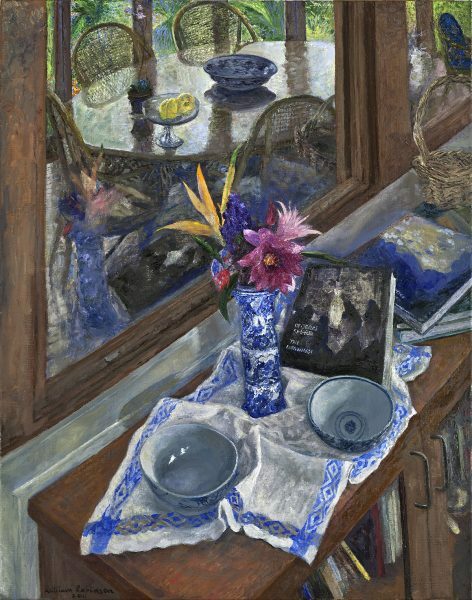 William Robinson, Still life with Chinese vessels, 2011, oil on linen. QUT Art Collection. Purchased 2011 through the William Robinson Art Collection Fund. William Robinson, The lattice verandah, 1971–72, oil on canvas. QUT Art Collection. Gift of Susan Carleton under the Cultural Gifts Program, 2002. William Robinson, born 1936, is often described as Australia’s greatest living landscape painter. 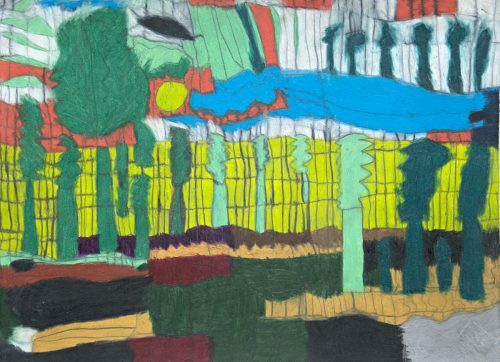 His use of multiple viewpoints of mountains, trees, the sea, and farmyards allows us to understand the landscape as if we are walking through it. He offers a unique perspective, one capable of giddying insights. However, Robinson has also unsettled the pomposity of portraiture and won the Archibald Prize in 1987 and 1995. 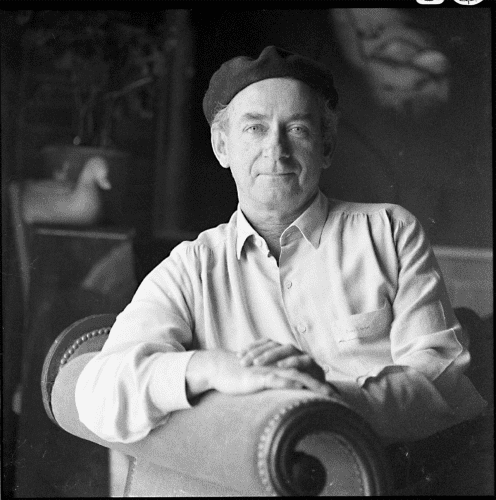 Louise Martin-Chew spoke to the octogenarian painter about his return to still life painting, his love of music, and his two current solo shows. 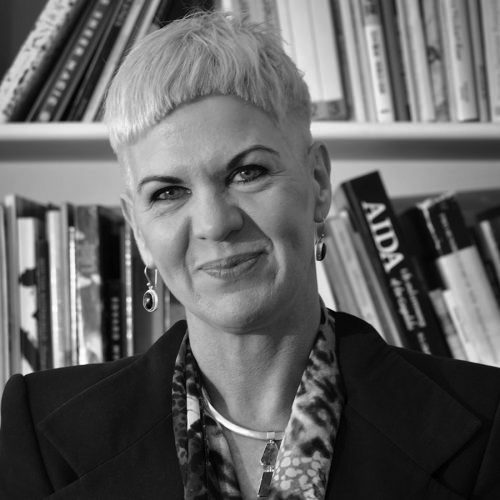 Louise Martin-Chew: Your work is celebrated for landscape, portraiture and, increasingly since 2010, still life. What can you add to an age-old genre? 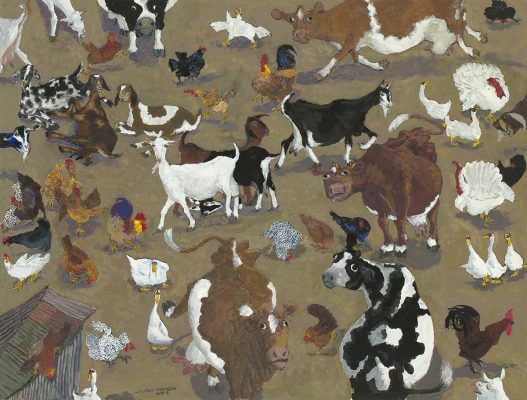 William Robinson: I don’t just do still life, I am still doing farmyards. I have lived on farms for 25 years so they are well and truly ingrained in my mind. I do work on a smaller scale but I often think of them as a type of still life. They are about the arrangement of things on the surface, whereby the positives of the objects or animals have to be balanced by the spaces in between. The exercise is not just of arrangements in a cold-blooded way but arrangements that give an aesthetic resolution. I love the Cezanne in the Art Gallery of NSW, it is also somewhat unresolved, and allows me to see the working process of the artist in the end. His most beautiful pictures are his ones that resolve like a series of chords in music, building until they come to a conclusion. There is an innate sense of rightness about it. 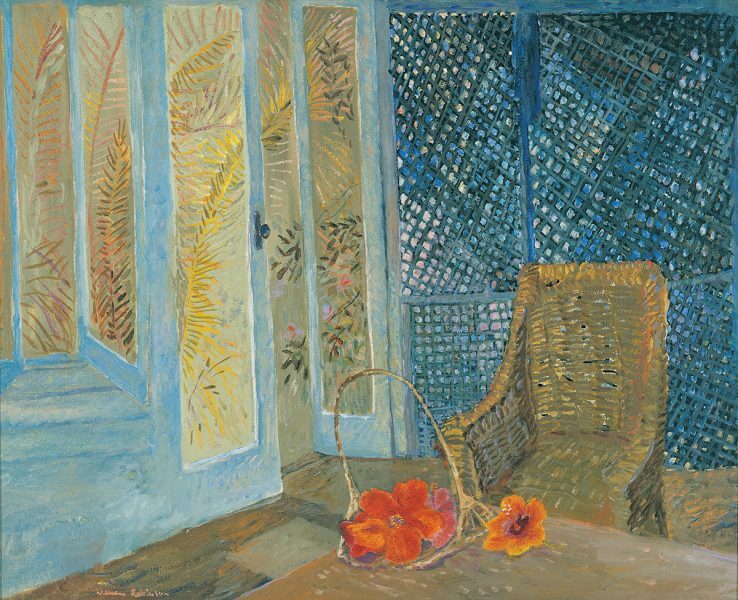 LMC: You are the only living Australian artist with a gallery devoted to your work, the William Robinson Gallery at Old Government House in Brisbane. Your survey show, Eternal Present, curated by John McDonald, takes us full circle, back to your early paintings in the still life genre. What insights does it offer for your audience, and for you? WR: When I look back on my work from the 1960s and 70s, I look back with a degree of dissatisfaction, of course. I didn’t know enough. The gallery is a warts and all thing. All of my pictures are thrown open to analysis, with the mistakes I made as a young man and, therefore, important to pass on. I’m still a teacher at heart and certainly not a perfect individual. All of my pictures are thrown open to analysis, with the mistakes I made as a young man and, therefore, important to pass on. I’m still a teacher at heart and certainly not a perfect individual. LMC: What drives you to keep working and innovating? WR: It is just getting up in the morning and getting through the day. I go for a walk and practice piano for a while. I play in the cracks, and it is part of sorting my mind out. At the beginning of a work I choose objects by looking at them, circling them like certain prey. I arrange lights and a painting may take a week or a month or two months (if large), so the lighting has to be right. Painting is satisfying and frustrating, and I refer to it from time to time as the day goes by. I break it up then begin stalking the picture again to see if there is anything I need to shift or add, apart from the light. William Robinson, Farmyard with corner shed, 2016, gouache, 46 x 61 cm. Courtesy the artist and Philip Bacon Galleries, Brisbane. LMC: Is still life also the subject of your solo show at Philip Bacon Galleries? WR: There are a number of farmyards in the Philip Bacon show. The farmyard is part of me. My psyche allows me to take in animals and chooks, allows me relationships which I can’t do with people so much. Having said that, it is mainly a still life show with number of pastels and oils. LMC: Composer Elena Kats-Chernin is creating new work for a concert at the William Robinson Gallery, also featuring Katie Noonan. It also looks back to your early life when you ultimately chose art over music. WR:It always has been a blend with me between music and painting. I listen to music all the time and I pick works that will move me while I am painting. I like to be taken away, music can carry you into another realm. Once I’ve done all that circling of the subject I am painting at my best when I’m not totally conscious of what I am doing. I am into another realm where I don’t calculate any more. Elena Kats-Chernin’s compositions catch with one’s emotions. And Katie Noonan has an extraordinary voice, it’s a beautiful song. LMC: The title of the still life show, Eternal Present, evokes the holistic physical/spiritual/environmental character of your Creation Landscapes. Is it a life-force that holds your work together? WR: That expresses it well. It is to do with a life-force that almost describes what we can’t describe about God. Even saying that, I’m aware that today it is unable to be said. We look for other words, yet the eternal life-force is exactly what I am trying to achieve in my work. There is nothing more spiritual than a great Vermeer still life. You can use the same application to Morandi. Their paintings are held together by an intersection which isn’t, strangely enough, necessary to get perfection. You can only strive for it mechanically with what we know. There will always be an imperfection, but some rightness produces the eternal present, in art down through the ages. LMC: Reinvention is your watchword. What next after your June/July exhibitions? WR: I am moving on into my 80s and so I think now my ambition is to just keep working and move from one work to another. And do whatever you can do as well as possible, into the eternal present, which means now as well as always. And hope that the next picture is going to be a good one. A musical tribute William Robinson and Margaret Olley by world renowned composer Elena Kats-Chernin, performed by Katie Noonan. 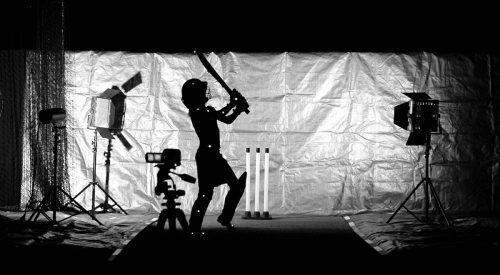 Their new collaboration, multi-channel video installation The Summation of Force, is a filmic love song to cricket, shot largely in their own backyard.